With April approaching quicker than most of us would like, tax season is officially upon us. While many citizens can’t help but dread the process of organizing their finances and filling out returns, tax season isn’t all bad. For many, tax season could mean a hefty return of some of your hard-earned income that the government previously borrowed. Although a tax refund can seem like a lovely bonus, it’s important to remember that you gave the government a surplus and are just receiving that back. The first instinct for many is to splurge and use their tax refund on something fun and exciting. Even though that may be the more enticing way to use your refund, it’s definitely not the smartest. This year, resist the urge to blow your refund on something you’ll only regret later. You can visit tax preparation winter haven fl to learn more about a wide array of financial and tax issues. Instead consider these eight tips to keep you from wasting it. When you receive a significant tax refund, it can be easy to think of it as a bonus or free money, which is likely why so many opt to spend it on something extraneous. Instead of running out and spending it as soon as you receive a check in the mail, stop and take the time to really think about what that money means. It’s not extra money the government is merely giving you. It really means you gave (or the government kept) more of your hard-earned money than you needed to. Think about the fact that your refund is money you worked hard for, like another paycheck. By doing so, you might be more cautious with what you choose to spend it on. Out of sight, out of mind, couldn’t be a truer statement. If you choose to put your refund right into your checking account, you make it all too easy to spend it. Opt to deposit your tax refund directly into an investment or savings account that isn’t easily reachable. By directly depositing it, you won’t have an opportunity to touch it or spend it in the first place. Moreover, depending on the savings account, you might not have access to it once it’s deposited, which is a surefire way to make sure you don’t waste it. Instead of going on a shopping spree or purchasing the newest Apple gadget, put your money toward any debt you may have. A great place to start is with any debt that has high interest rates. Since high interest rates means you’ll accumulate the amount you owe rather quickly, it’s important to try and pay off more than the minimum every chance you get. If you still have some of your tax refund left over, move on to other debt. You’ll be glad you did, since debt has a tendency to hold you back financially. Life throws curveballs at us when we’re least expecting it, which is why it’s imperative to build a solid emergency fund for desperate times. If you haven’t started one, do so now. If you have already started one, use your refund to replenish or build it even more. Whether you need it for unemployment, a broken appliance, or medical bills, you’ll be thankful you built up a solid fund when hard times hit. If you don’t already have a retirement account set up, use this as an opportunity to start one. If you do have an account already, use it as an opportunity to save extra. Anytime you can boost your retirement savings is a good idea and your future self will thank you for it! The wonderful thing about this option is that you’re still using your refund in a smart way, but it can also be an exciting thing to spend it on as well. 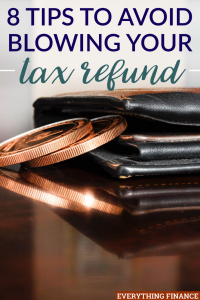 Use your refund in a way that’s going to benefit you in the long run. That could mean everything from continuing your education, to subscribing to publications in your field, to buying equipment you need, or even investing in therapy or fitness goals to create a healthier you. All great things that are fun and exciting, but could also serve to help you grow financially as well. If you find that you have a large tax refund, and maybe have for a couple of years, you may want to consider reducing your withholdings in the future. While a refund is a good thing, you could have used that money for other, better things throughout the year. If you’d put that money in a savings or investment account initially, it could have used this time to grow and prosper. Furthermore, you’ll still receive some of that money you don’t give in each paycheck and receive a little more than usual, which means you also might change your perspective from viewing it as free money to hard-earned income that you should spend judiciously. After all is said and done, once you’ve contributed the majority of your refund to the important financial things, like savings and investments, don’t be afraid to indulge a little. Everyone has moments in their lives when they need to splurge a little, and it can often keep us from splurging big when we reward ourselves in smaller amounts. Set aside a small portion of your refund to use for something you truly enjoy. Go out and buy a new outfit, treat yourself to a massage, or go out for a nice dinner. You won’t waste your entire refund, but you’ll get to enjoy a little bit of it as well. When you see large amounts coming out of your paycheck each month, taxes can have a tendency to get you down. And tax season isn’t exactly a holiday, which is why receiving a significant refund can seem like an exciting bonus at the end of a year. Still, resist the impulse to spend it all and try putting it towards the things that will benefit you in the long run. You can also take a CFA online course and become an expert. And while you are it make a career out of it. Do you often waste your tax refund? What are some other smart ways you could use it?